Articles were authored by members of the HSRC Executive Management Board and its subcommittees. Wong D. Holistic approaches to big data analytics deployment is needed - Response to Kiret Dhindsa K, Bhandari M, Sonnadara R R. What's holding up the big data revolution in healthcare? BMJ 2018; 363 (Published 28 December 2018). Moonesinghe S, Moppett I. Working with you to improve patient care: the Health Services Research Centre. Bulletin: The magazine for the members of the Royal College of Anaesthetist. (112), 31. Moonesinghe S, Moppett I. Meet the HSRC Team. Bulletin: The magazine for the members of the Royal College of Anaesthetist. (112), 32-33. Sogbodjor A, Moppett I, Vindrola C, Moonesinghe S. What's coming next? Four exciting new initiatives on the horizon - The forgotten tribe: improving the care of the emergency paediatric surgical patient. Bulletin: The magazine for the members of the Royal College of Anaesthetist. (112), 40. Moppett I. National Audit Projects (NAPs). Bulletin: The magazine for the members of the Royal College of Anaesthetist. (112), 37. Cook T. Launch of NAP6 and selection of the topic for NAP7 - perioperative cardiac arrest. Bulletin: The magazine for the members of the Royal College of Anaesthetist. (111), 24-25. Why do the NAPs take so long? Do NAPs improve patient safety? What have the NAPs done for us? Egner W, Cook T, Garcez T. et al. Specialist perioperative allergy clinic services in the UK 2018: Results from the Royal College of Anaesthetists Sixth National Audit Project (NAP6) investigation of perioperative anaphylaxis. Clin Exp Allergy. 2018 Jul;48(7):846-861. doi: 10.1111/cea.13180. Harper N, Cook T, Garcez T et al. Anaesthesia, surgery, and life-threatening allergic reactions: management and outcomes in the 6th National Audit Project (NAP6) Br J Anaesth. 2018;121(1):172-188. doi: 10.1016/j.bja.2018.04.015. Harper N.J., Cook T.M., Garcez T. et al. Anaesthesia, surgery and life-threatening allergic reactions: Epidemiology and clinical features of perioperative anaphylaxis in the 6th National Audit Project (NAP6) Br. J. Anaesth. 2018;121:159-171. doi: 10.1016/j.bja.2018.04.014. Kemp H, Marinho S, Cook T. et al. An observational national study of anaesthetic workload and seniority across the working week and weekend in the UK in 2016: the 6th National Audit Project (NAP6) Activity Survey. Br. J. Anaesth. 2018 Jul;121(1):134-145. doi: 10.1016/j.bja.2018.04.010. Cook T, Harper N, Farmer L. et al. Anaesthesia, surgery, and life-threatening allergic reactions: protocol and methods of the 6th National Audit Project (NAP6) of the Royal College of Anaesthetists. Br. J. Anaesth. 2018 Jul;121(1):124-133. doi: 10.1016/j.bja.2018.04.001. Why is NAP 5 in Ireland? Poulton T, Murray D; National Emergency Laparotomy Audit (NELA) project team. Pre-optimisation of patients undergoing emergency laparotomy: a review of best practice. Anaesthesia. 2019 Jan;74 Suppl 1:100-107. doi: 10.1111/anae.14514. Oliver CM, Bassett MG, Poulton TE, Anderson ID, Murray DM, Grocott MP, Moonesinghe SR et al. Organisational factors and mortality after an emergency laparotomy: multilevel analysis of 39 903 National Emergency Laparotomy Audit patients. Br J Anaesth. 2018 Dec;121(6):1346-1356. doi: 10.1016/j.bja.2018.07.040. Eugene N, Oliver CM, Bassett MG, Poulton TE, Kuryba A, Johnston C, Anderson ID, Moonesinghe SR et al. Development and internal validation of a novel risk adjustment model for adult patients undergoing emergency laparotomy surgery: the National Emergency Laparotomy Audit risk model. Br J Anaesth. 2018 Oct;121(4):739-748. doi: 10.1016/j.bja.2018.06.026. Byrne BE, Bassett M, Rogers CA, Anderson ID, Beckingham I, Blazeby JM; Association of Upper Gastrointestinal Surgeons for the National Emergency Laparotomy Project Team. Short-term outcomes after emergency surgery for complicated peptic ulcer disease from the UK National Emergency Laparotomy Audit: a cohort study. BMJ Open. 2018 Aug 20;8(8):e023721. doi: 10.1136/bmjopen-2018-023721. 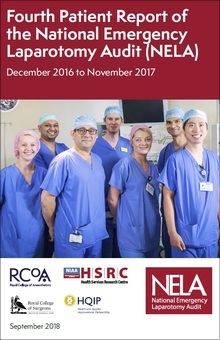 Peacock O, Bassett MG, Kuryba A, Walker K, Davies E, Anderson I, Vohra RS; National Emergency Laparotomy Audit (NELA) Project Team. Thirty-day mortality in patients undergoing laparotomy for small bowel obstruction. Br J Surg. 2018 Jul;105(8):1006-1013. doi: 10.1002/bjs.10812. Poulton TE, Salih T, Martin P, Rojas-Garcia A, Raine R, & Moonesinghe SR. Systematic review of the influence of socioeconomic deprivation on mortality after colorectal surgery. Br J Surg. 2018 Jul;105(8):959-970. doi: 10.1002/bjs.10848. Hare S, Murray D, Poulton T. National Emergency Laparotomy Audit: The 4th Report. The International Anaesthetist. Hare S. NELA: more than just another audit. RCoA Blog. Hare S, Murray D. National Emergency Laparotomy Audit (NELA): The Fourth Patient Report. Bulletin: The magazine for the members of the Royal College of Anaesthetist. (112), 34-35. Johnston C. Using data to improve care: NELA regional workshops. Bulletin: The magazine for the members of the Royal College of Anaesthetist. (110), 26-27. Hare S. Engaging with emergency laparotomy patients. Bulletin: The magazine for the members of the Royal College of Anaesthetist. (108), 26-27. S Lockwood, R Atkin, H Carson-Boyd. Emergency Laparotomy in the elderly. Journal of the Association of Surgeons of Great Britain and Ireland. (49). Timing of surgical source control and outcomes; should we operate out of hours? Can we predict individual outcomes from NELA? PCPIE - Is it a jolly police officer...? Or a politically correct pastry dish...? Evans B.PCPIE - Is it a jolly police officer...? Or a politically correct pastry dish...?. Bulletin: The magazine for the members of the Royal College of Anaesthetist. (112), 40. Gilhooly D, Moonesinghe SR. The Perioperative Quality Improvement Programme: improving outcomes. Br J Hosp Med (Lond). 2018 Feb 2;79(2):117. doi: 10.12968/hmed.2018.79.2.117. Chazapis M., Gilhooly D., Smith A.F., Myles P.S., Haller G., Grocott M.P.W., Moonesinghe S.R. Perioperative structure and process quality and safety indicators: a systematic review. Br J Anaesth. 2018 Jan;120(1):51-66. doi: 10.1016/j.bja.2017.10.001. Bedford J. No naming and shaming - only celebrating success: How PQIP hopes to improve care and outcomes from major surgery. Bulletin: The magazine for the members of the Royal College of Anaesthetist. (112), 36. Wagstaff D, Sahni A, Bedford J, Moonesinghe S. Calling all anaesthetists in training and trust doctors! An opportunity to get involved with PQIP and drive local quality improvement. Bulletin: The magazine for the members of the Royal College of Anaesthetist. (110), 28-29. PQIP is one year old - are you involved? Sahni A, Moonesinghe S. (2018). PQIP is one year old - are you involved? Bulletin: The magazine for the members of the Royal College of Anaesthetist. (108), 28-29. 2. Does PQIP work and why (or not)? 3. Working with local innovators: the Manchester ERAS+ collaboration"
Johnston C. The Quality Network: Our next steps. Bulletin: The magazine for the members of the Royal College of Anaesthetist. (111), 26-27. What is the value of quality improvement? Wong D, Moonesinghe S. Sprint National Anaesthesia Projects (SNAPs). Bulletin: The magazine for the members of the Royal College of Anaesthetist. (112), 38. Click here to listen, SNAP-2 coverage starts at 02:07:58. "Many serious surgeries cancelled on the day, study finds". "One in seven operations cancelled on day of surgery, study finds". "Record numbers of operations cancelled at last minute thanks to A&E chaos". "One in seven NHS operations cancelled on the day"
"One in seven major operations in UK cancelled on day of surgery, data shows". "NHS cancels 14% of operations at last minute, research finds". "One in seven NHS operations 'cancelled or postponed'". "One in seven operations CANCELLED on day of surgery at overstretched hospitals, data shows". "26,000 NHS operations 'CANCELLED on the day they were due to take place this year'". "One in seven NHS operations are cancelled on the DAY of the surgery". "Cancelled operations in the first quarter on the rise at Basildon Hospital, while Southend Hospital's drop"
Wong DJN, Harris SK, Moonesinghe SR. Cancelled operations: a 7-day cohort study of planned adult inpatient surgery in 245 UK National Health Service hospitals. British Journal of Anaesthesia. 2018 Oct 1;121(4):730-8. Man vs machine: how good are clinicians at predicting perioperative risk? Wong DJN, Sahni A, Bedford JR, Harris SK, Moonesinghe SR. Man vs machine: how good are clinicians at predicting perioperative risk? British Journal of Anaesthesia. 2018 Aug 1;121(2):e28-9. The perceptions of UK clinicians towards postoperative critical care. Hashim S, Wong D, Harris S, Moonesinghe S. The perceptions of UK clinicians towards postoperative critical care. Anaesthesia. 2018 Jan;73(S2):74. Wong D, Bedford J, Chazapis M, Farmer L, Saunders D, Harris S, et al. Postoperative critical care facilities in the UK: not as simple as 1-2-3. In: Abstracts of the AAGBI WSM London. London, UK: Anaesthesia; 2018. p. 71. Man vs. Machine - How good are Clinicians at Predicting Perioperative Risk? Buggy DJ, Freeman J, Johnson MZ, Leslie K, Riedel B, Sessler DI, Kurz A, Gottumukkala V, Short T, Pace N, Myles PS; StEP-COMPAC Group. Systematic review and consensus definitions for standardised endpoints in perioperative medicine: postoperative cancer outcomes. Br J Anaesth. 2018 Jul;121(1):38-44. doi: 10.1016/j.bja.2018.03.020. Abbott TEF, Fowler AJ, Pelosi P, Gama de Abreu M, Møller AM, Canet J, Creagh-Brown B, Mythen M, Gin T, Lalu MM, Futier E, Grocott MP, Schultz MJ, Pearse RM; StEP-COMPAC Group. Et al. A systematic review and consensus definitions for standardised end-points in perioperative medicine: pulmonary complications. Br J Anaesth. 2018 May;120(5):1066-1079. doi: 10.1016/j.bja.2018.02.007. Myles PS, Boney O, Botti M, et al. Systematic review and consensus definitions for the standardised endpoints in perioperative medicine (StEP) initiative: patient comfort. Br J Anaesth. 2018 Apr;120(4):705-711. doi: 10.1016/j.bja.2017.12.037. Boney O.Which clinical outcomes matter to patients and clinicians? The COMPAC and StEP Collaboratives. Bulletin: The magazine for the members of the Royal College of Anaesthetist. (112), 39.